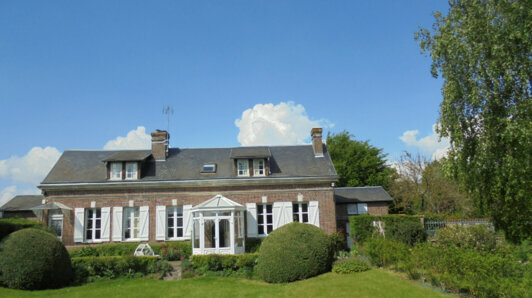 A beautiful and quiet property stretching in a green environment over 5 ha wide, located along the river Morin, 20 mn away from Disneyland Paris and less than one hour drive from Paris. It consists of 12 main rooms dispatched on three levels. On the ground level is the entrance hall, a bright and wide-open living room (130m2) with wooden beams and a fire-place opening on a specious terrace looking out onto the property and the valley, a huge and fully equipped kitchen and its scullery. Then you can find a bedroom or office and a separate night area with 3 bedrooms each having its own private bathroom and dressing. The 1st level (more than 180 M2) is divided into a mezzanine looking over the living room, a first bedroom and a huge attic room to be converted (possible to create 2 rooms with bathrooms). As concerns your receptions, the lower ground level is actually equipped with a room dedicated to sports next to a huge bright room with large windows opening on another terrace and the garden. On this same level you can also find a cellar, a laundry room, a technical place and a garage where you can park four cars. This property if under electronic surveillance, pavements are made of stone and marble. Nearby the main house is situated a caretaker's house (120m2). A real secondary house consisting of a living room, separate kitchen, 3 bedrooms among which 2 are on the first floor, a bathroom, toilets and a garage. The whole property is situated in the calms and greenery and surrounded by a landscaped and raised garden, a pond, the banks of the river Morin, a tennis court and a swimming pool (that has to be renewed).